Northwest corner of the intersection of S. MacArthur Blvd. 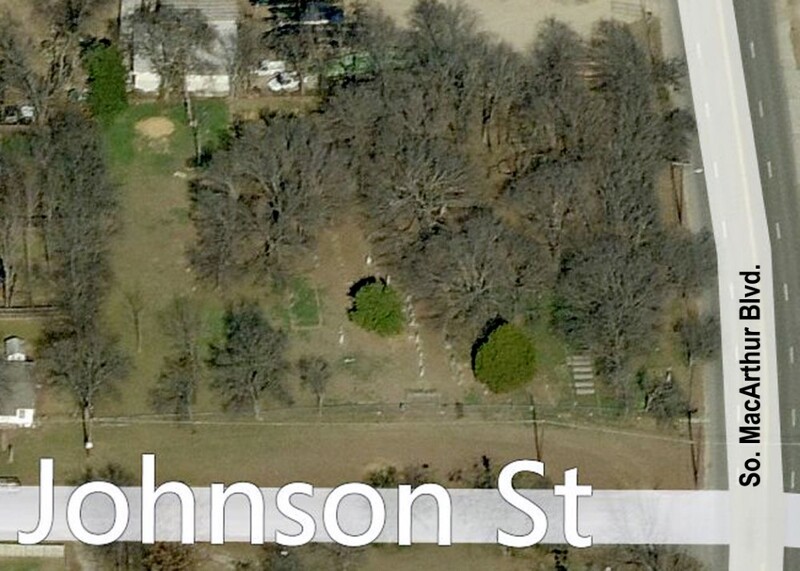 and Johnson St.
Jordan-Hight Cemetery was recorded in April 2010 by Tom Cogdell, Trish Nunn, Bonnie Cockrum, Howard McCalla, Lynn Shumaker and Regina Shumaker. Row one begins in the southeast corner of the Cemetery along the east fence. The rows are numbered from east to west. Tombstones are numbered from south to north in each row. In this recording, tombstones were numbered consecutively with no allowance for empty spaces. Approximately thirteen years before his death, David A. Jordan (1808-1879) dedicated approximately one acre of his land for a family cemetery on the death of a relative by marriage, Robert A. Hight (1826-1866) who died of a fever that he contracted while in the service of the Confederacy. Martha Ann Hight, his wife, wanted to lay him to rest near Duncanville where they lived. However, when David A. Jordan agreed to dedicate a family cemetery if Robert A. Hight could be buried in the family plot, she agreed and he became the first and earliest marked grave located in this new cemetery near the Jordan ranch home. Prior to the formation of the official cemetery association, this cemetery was known as the Hight Cemetery, The Jordan Cemetery, The Bowles Cemetery, and the Jordan-Bowles Cemetery, depending upon the reference. The formation of the association clarified this for the record and history. According to a 1970’s abstract by the Grand Prairie Historical Society, there were four HIGHT marked graves and twenty JORDAN marked graves. The unmarked or “natural” marked graves with no identification numbered 34 in the 1970’s abstract and the research continues in this area of interest. The cemetery has sites reserved for individual descendants and sites available for others who might desire space. The policy of the association is that descendants of anyone presently buried in these grounds shall be provided upon request. If space is available, others might be considered. There are persons who were employees of the Hight, Jordan, and Bowles families that are buried here and also unmarked graves that are thought to have been Indian and Mexican itinerants that were accepted for burial by the early families. No restrictions on markers is in existence. A recent burial was an indigent of this community with no family, a Mary G. Swain (1919-1984). Important early settlers buried in this cemetery include the BRANNAN family, the HIGHT family, the MILLER family, SIMEON MUGG, the ROBERTSON family, and the distinctly important JORDAN family. David A. Jordan was an important appointee of the Dallas County Court in Precinct #9 (Grand Prairie area) serving in 1864, 1865, and 1867 as President of the local election. Following the death of David A. Jordan and his second wife, Elizabeth Hight Jordan in 1915, the property and/or the house, and probably the cemetery, either passed to Emma Jordan Campbell by inheritance or was purchased by Emma Campbell and her husband, Squire Campbell. Victor Bowles purchased the ranch including the house and the cemetery from the Campbell’s in 1886. The house, including 100 acres of land, passed to Victor S. Bowles, Jr. (deceased) on January 27, 1927, thence to the surviving heir, Minnie E. Bowles during 1927. Minnie E. Bowles sold the cemetery to the Jordan-Hight Family Cemetery, Inc., on 23 September 1955 following the chartering of the cemetery on 2 September 1955, State Charter #127949. Trustees named in the original document were Thomas H. Hight, Sr., May Long, and Maud Jordan Holland. The association was not very active until 1983, when a new group of officers and directors were elected. The association is actively managing this cemetery. It has established a permanent trust fund to provide perpetual maintenance capability but have made no commitment to perpetual care under the law. All receipts and donations from friends are welcome. The Association is assisted by the Teen Jury (under the direction of Judge Cameron Gray) and the Probation Department of the Dallas County Judicial System. Both of these groups have provided manpower in the upkeep of the grounds, which are in excellent condition, with a continuing planned program of maintenance. NOTE: The preceding information was compiled by Buck Smith, President of the Jordan-Hight Family Cemetery Association, and Ruthe Jackson, Assistant in Research. Main entrance gate located on the south side of the cemetery. From outside the entrance gate looking east. From outside the entrance gate looking west.